Victoria Falls, or Mosi-oa-Tunya (Tokaleya Tonga: the Smoke that Thunders), is a waterfall in southern Africa on the Zambezi River at the border of Zambia and Zimbabwe. While it is neither the highest nor the widest waterfall in the world, it is classified as the largest, based on its width of 1,708 metres (5,604 ft) and height of 108 metres (354 ft), resulting in the world's largest sheet of falling water. Victoria Falls is roughly twice the height of North America's Niagara Falls and well over twice the width of its Horseshoe Falls. 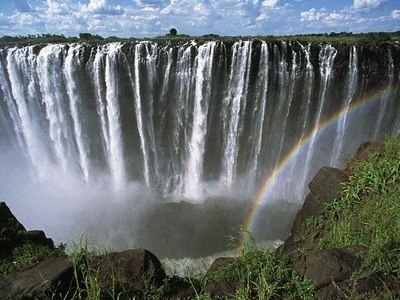 In height and width Victoria Falls is rivalled only by Argentina and Brazil's Iguazu Falls. See table for comparisons. For a considerable distance upstream from the falls the Zambezi flows over a level sheet of basalt, in a shallow valley, bounded by low and distant sandstone hills. The river's course is dotted with numerous tree-covered islands, which increase in number as the river approaches the falls. There are no mountains, escarpments, or deep valleys; only a flat plateau extending hundreds of kilometres in all directions. 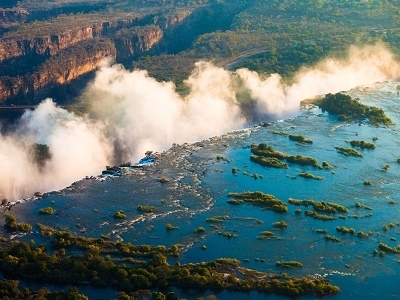 The whole volume of the Zambezi River pours through the First Gorge's 110-meter-wide (360 ft) exit for a distance of about 150 meters (500 ft), then enters a zigzagging series of gorges designated by the order in which the river reaches them. Water entering the Second Gorge makes a sharp right turn and has carved out a deep pool there called the Boiling Pot. Reached via a steep footpath from the Zambian side, it is about 150 metres (500 ft) across. Its surface is smooth at low water, but at high water is marked by enormous, slow swirls and heavy boiling turbulence. Objects-and humans-that are swept over the falls, including the occasional hippo, are frequently found swirling about here or washed up at the north-east end of the Second Gorge. This is where the bodies of Mrs Moss and Mr Orchard, mutilated by crocodiles, were found in 1910 after two canoes were capsized by a hippo at Long Island above the falls. Third Gorge: 600 m south, 1.95 km long (650 yd south, 2100 yd long), containing the Victoria Falls Power Station. Songwe Gorge: 5.3 km south, 3.3 km long, (3.3 mi south, 2 mi (3.2 km) long) named after the small Songwe River coming from the north-east, and the deepest at 140 m (460 ft), the level of the river in them varies by up to 20 meters (65 ft) between wet and dry seasons. The two national parks at the falls are relatively small — Mosi-oa-Tunya National Park is 66 square kilometres (16,309 acres) and Victoria Falls National Park is 23 square kilometres (5,683 acres). However, next to the latter on the southern bank is the Zambezi National Park, extending 40 kilometres (25 mi) west along the river. Animals can move between the two Zimbabwean parks and can also reach Matetsi Safari Area, Kazuma Pan National Park and Hwange National Park to the south. On the Zambian side, fences and the outskirts of Livingstone tend to confine most animals to the Mosi-oa-Tunya National Park. In addition fences put up by lodges in response to crime restrict animal movement. Although Zimbabwe has had recent economic difficulties, Victoria Falls town has always been somewhat removed and the people are as welcoming and friendly as ever. Tourism slowed down over the last 10 years but many hotels have taken this time to renovate and improve. Mopane woodland savannah predominates in the area, with smaller areas of Miombo and Rhodesian Teak woodland and scrubland savannah. Riverine forest with palm trees lines the banks and islands above the falls. The most notable aspect of the area's vegetation though is the rainforest nurtured by the spray from the falls, containing plants rare for the area such as pod mahogany, ebony, ivory palm, wild date palm and a number of creepers and lianas. Vegetation has suffered in recent droughts, and so have the animals that depend on it, particularly antelope. The national parks contain abundant wildlife including sizable populations of elephant, buffalo, giraffe, zebra, and a variety of antelope. Lion and leopard are only occasionally seen. Vervet monkeys and baboons are common. The river above the falls contains large populations of hippopotamus and crocodile. Elephants cross the river in the dry season at particular crossing points. Klipspringers and clawless otters can be glimpsed in the gorges, but they are mainly known for 35 species of raptors. The Taita Falcon, Black Eagle, Peregrine Falcon and Augur Buzzard breed there. Above the falls, herons, Fish Eagles and numerous kinds of waterfowl are common. The river is home to 39 species of fish below the falls and 89 species above it. This illustrates the effectiveness of the falls as a dividing barrier between the upper and lower Zambezi. The two countries permit tourists to make day trips from each side and visas can be obtained at the border posts. Costs vary from US$20-50.00. Visitors with single entry visas will need to purchase a visa each time they cross the border. Regular changes in visa regulations mean visitors should check the rules before crossing the border. The numbers of visitors to the Zimbabwean side of the falls has historically been much higher than the number visiting the Zambia side, due to the greater development of the visitor facilities there. However, the number of tourists visiting Zimbabwe began to decline in the early 2000s as political tensions between supporters and opponents of president Robert Mugabe increased. In 2006, hotel occupancy on the Zimbabwean side hovered at around 30%, while the Zambian side was at near-capacity, with rates in top hotels reaching US$630 per night. The rapid development has prompted the United Nations to consider revoking the Falls' status as a World Heritage Site. In addition, problems of waste disposal and a lack of effective management of the falls' environment are a concern. A famous feature is a naturally formed pool known as the Devil's Pool, near the edge of the falls, accessed via Livingstone Island in Zambia. When the river flow is at a certain level, usually during the months of September to December, a rock barrier forms a pool with little current and some people swim in the pool. Occasional deaths have been reported when people slip over the edge of the rock barrier. Here's the our members favorite photos of "Waterfalls in Zambia". 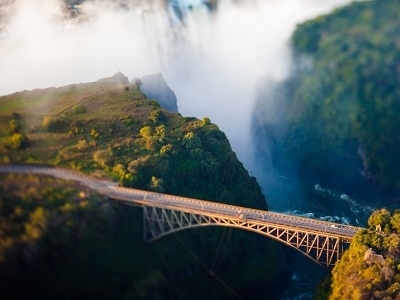 Upload your photo of Victoria Falls! Get in touch with 160 Touristlink members who want to visit Victoria Falls or with Robert Brownfarley, Jackson Mugo and 47 others who already have been here.